Please note party assessments were made using material available on 23 Nov 2018. All referenced links were alive at the time of assessment. The number next to the party name indicates our order of ranking. You will then need to interpret our rankings and the detailed assessment below and vote as per the instructions from the VEC on both the large and small ballot papers. Not all parties are running in all districts or regions. All other parties fall into the 'no climate policy category'. This includes the Justice Party, Shooters and Fishers and the Battler Party. Number them anywhere from 7 onwards. WHAT IS Safe Climate POLICY? Drive the creation of Emergency Plans for Safe Climate Restoration. Implement an emergency speed transition (10 years or less) to a safe climate economy. Our policies are designed to drive our emissions to net negative and begin the process of rapid cooling of the planet. They are to be rolled out at emergency speed over ten years or less. This would require significant restructuring of a variety of industries, the closure of some and the creation of others. Communities and workers would be supported to manage this transition and opportunities will be created for firms to re-purpose as part of structural adjustment planning. We must also transition our economy away from dependence on constant material and population growth, human exploitation and high levels of debt, while continuing knowledge growth, and service and technological improvements. If we do this we have a chance of making a truly sustainable future. Parties in this category recognise as necessary the need to create negative emissions at emergency speed and return to a safe climate to maximise survival of human and non human life. Full climate emergency policy with focus on maximum protection of human and other life. See www.voteplanet.net/policies.html for Save the Planets policies on reversing global warming. Parties in this category recognise we are in a claimte emergency but either are too slow. lack detail or have inconsistencies that prevent them from being in the Safe Climate category. ​Animal Justice Party focuses on the issue of animal cruelty. 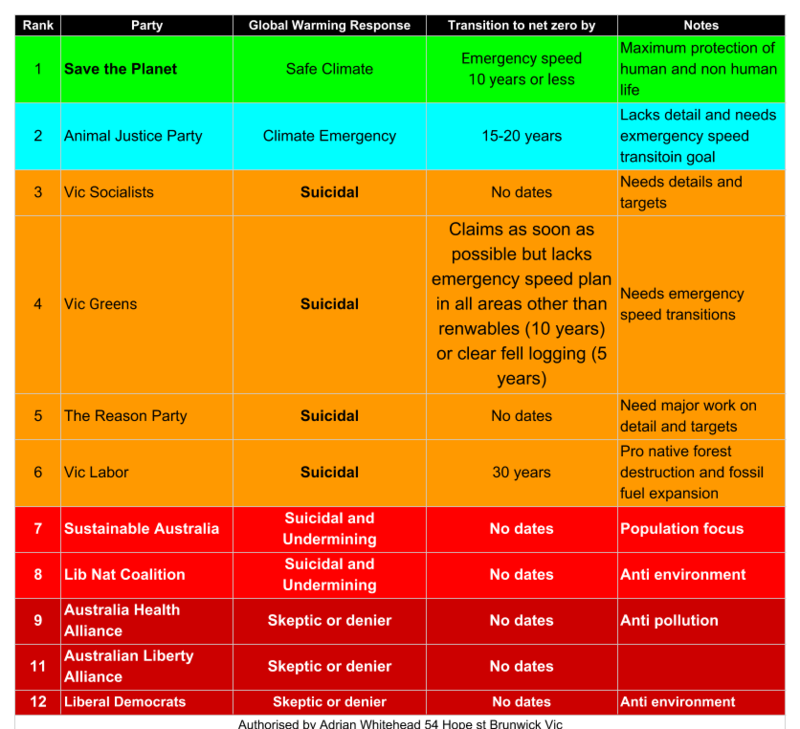 Animal Justice Party has the clearest framing of any party, other than Save the Planet, as to the threat of global warming, recognising issues, such as it is an emergency, and that warming needs to be reversed. They argue for a rapid (15-20 year) transition rather than a emergency speed transition (10 years or less). Their policy lacks significant detail in any area but makes reference to carbon free energy, reducing impacts of animal agriculture, opposing gas as a transition fuel, revegetation, and protecting all native forests, but makes no reference to transport or energy efficiency. The climate emergency is given a low priority on their website appearing as a subset of the environment policies. In conclusion: Animal Justice Party’s rapid vs emergency speed transition runs contrary to their core values of protection of animals, as the slower target will cause the avoidable deaths and suffering of millions upon millions of animals. The lack of priority on their website and election material says that the party is yet to understand the true threat the climate emergency poses on animals and sends the wrong message to its members and supporters that this is not a priority issue. Parties in this category do not have policies strong enough to prevent a climate catastrophe, save the Great Barrier Reef or prevent the loss of massive areas of coastline, and the death o millions. The Victorian Socialists focus on building a more equitable society and providing better services to the “working class”. Victorian Socialist chose to frame the climate emergency as a “climate crisis” and see current action as “crime against humanity”. However their policy does to define any clear target other than “carbon emissions must be dramatically reduced” and lacks any reference to reaching net zero or net negative emissions. Their policy has significant detail in the area of transport, arguing for a massive improvement in public transport and cycling. There is detail around renewable energy with a target of 60% by 2025 but this in contradicted by a later reference to 40% by 2030 and there is no target date for 100% renewables. There is reference to energy efficiency in buildings, and opposition to gas as transition fuel but no reference to the impacts of animal agriculture. Socialists propose protecting old growth forest but not native forests in general. The climate emergency has been given low priority on their website and does not receive its own policy heading and instead is referred to under the heading “environment” and is NOT one of their stated top 14 campaign goals.The term “climate crisis” appears on their leaflet making it one of the only parties to raise the issue of the climate emergency in their printed material but it did not appear on their HTV card. In conclusion: Victorian Socialists lack any detail around targets and time frames for emission reduction. The lack of scope, and lack of priority in the position of the issue in policy and on their website shows the party is yet to understand the true threat the climate emergency poses to the people of this planet including their core constituents the “working classes” and sends the wrong message to its members and supporters that this is not a priority issue. The Victorian Greens claim to care for people and the environment while creating a positive future. The Victorian Greens use the term “climate emergency”, recognising that climate change is “one of greatest threats to our world in human history and requires urgent local, national and global action” and have an aim of “net zero or negative emissions as soon as possible” without any specified dates. Their climate policy has the most detail of any party and includes comprehensive policies on renewable energy, public transport, and a “climate commissioner” to oversee the climate response. However only the renewable energy policy could be considered an climate emergency response. Unfortunately there is only a limited reference to reducing the impacts of animal agriculture and the Greens are not calling for an immediate end to native forest destruction but rather a transition of up to five years and a continuation of small scale and “local” native forest logging, additional destruction that simply does not have to occur. The Greens are also proposing to take organic waste to make compost, which will increase greenhouse gas emissions if redirected from well managed landfills and remove the potential for biochar production to draw down past emissions. Climate change has been given medium priority on their website with a separate policy title “Climate” and at least six out their 44 featured campaigns (20/11/18) focused on issues relevant to climate change. Unfortunately climate change was not a feature of their how to vote card or leaflets. In conclusion: the Victorian Greens lack of a clear dates for net zero or net negative which undermines the validity of the Greens’ commitment to a climate emergency frame and this framing is further undermined by non climate emergency policy in all other areas other than stationary energy. The Greens’ current policy would fail to meet their core values of protecting people and the environment and along with their lack of priority sends the wrong message to its members and supporters that this is not a priority issue. The Reason Party is a largely a progressive libertarian party. The Reason party acknowledges climate change and the need for a post carbon economy but does not frame it as a climate emergency. Their policy has some detail in the areas of transport and some vague statements about renewable energy, lacking all reference to animal agriculture and native forest destruction’s contribution to global warming, but includes a requirement to audit sea level rise and extreme weather events. In conclusion: The Reason Party’s lack of recognition of the urgency of the situation combined with the lack of priority, scope and any detail shows the party is yet to understand the true threat the climate emergency poses and send the wrong message to its members and supporters that this is not a priority issue. Labor is the Government of the day and will at some point be held to account for their lack of action to reverse global warming. In their current election campaign, they have focused largely on the issue of infrastructure. On the negative side Labor has gone out of its way to continue the destruction of old growth and native forest, purchasing a mill that was about to close, and running the industry on multi-million dollar subsidies and additional multi million dollar losses to our water supply. They continue to support offshore oil and gas exploration, have extended the lease of coal plants for decades, recently fast tracking a brown-coal-to-liquid fuel project and support expensive major road projects. On the Dan Andrews’ website (https://danandrews.com.au/positive-plans/), which is the main website for the party, climate change has been given low priority and does not feature as one of their key issues (Health, Education, Transport, Jobs, Fairness), nor is it referenced in in relation to the solar policies which are framed as saving money. Reducing emissions is mentioned in relation to their VRET target of 50% by 2030. There also seems to be a deliberate decision to present policies in an almost random assortment of summaries where a policy on a single set of traffic lights sits next to state significant policies in a seeming attempt to make accessing any specific policy or policy theme more difficult. However unlike the Liberal party you can access Vic Labor’s main policy platform form the Vic Labor website, where climate does appear as the heading “Delivering on Climate” under “Sustainable Communities in their 2018 policy platform available under their state Labor website https://www.viclabor.com.au/resources/. In conclusion: Of the two major parties Labor is miles ahead of the Liberal party, but they are yet to adopt policies and targets that will prevent a climate catastrophe. Their commitment to native forest destruction, oil and gas exploration, roads and lack of any comprehensive plan to reduce emissions from animal agriculture suggests their commitment to climate action is based around their political position in relation to Greens and Liberals and adopting popular policies rather than a genuine commitment to reverse global warming. Climate change has been given very low priority on their website and is not mentioned in any of their four main policy statements or any of their 16 policy highlights or 24 policy headings, and appears as a sub heading of the environment policy. Their climate policy claims to support limiting warming to 1.5 degrees but has no chance of achieving this with their strongest stated target being an 80% reduction on 2000 level of greenhouse gas emissions by 2050, which is below Labor’s target of net zero by 2050. The remainder of their climate policy focuses on energy and population. Additional problems with their policy include support of natural gas use, and consideration of nuclear power as part of the energy mix. They are yet to commit to a permanent ban on fracking and coal seam gas mining. On the good side they do mention the benefits of a plant based diet and issues around urban planning. In conclusion: This party’s refusal to have meaningful and safe climate policy shows the party is not committed to true environmental sustainability and suggests their population policies may be motivated by other issues. The Liberals are running on crime this election. The Liberal and National coalition represents an extreme risk to our future and environment with commitments to scrap or wind back Labor’s policies on renewable energy and climate targets and refusal to stop native forest destruction. On positive side they have proposed a $4 million community solar program, high speed rural rail upgrades, and propose to continue to ban fracking. You can access the Vic Liberal platform but unlike the Labor party platform which contains detailed policy, the Liberals is a short series of motherhood statements. (https://vic.liberal.org.au/AboutUs/OurPlatform). Conclusion: The Liberal National coalition is anti renewables, anti action on climate change, pro native forest logging and pro fossil fuels. Don’t vote for these guys. Parties in this category are either deniers or are sceptical about the science that global warming either exists or is human forced. ​Vote for these guys last. Have a series of anti environmental policies including being pro nuclear power, and pro native forest destruction.